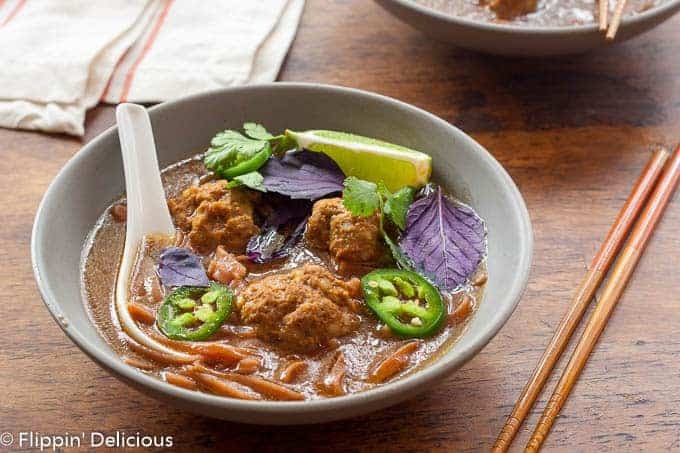 Gluten Free Asian Meatball Soup is inspired by one of my favorites, Pho! This flavorful bone-broth-based soup can easily be made in an Instant Pot, or on the stovetop. This post is sponsored by Kitchen Accomplice. As always, all opinions are entirely my own. Thanks for supporting the brands featured on Flippin’ Delicious™. Pho has been one of my favorites, ever since I discovered it at a small family-owned restaurant near my parent’s house. It is in the same strip mall as my dad’s chiropractic office. I loved grabbing rice-wrapped spring rolls for lunch while I was working for him. 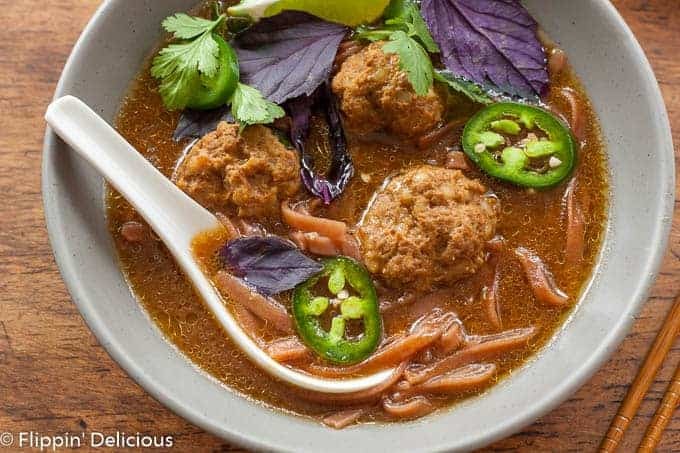 While I am definitely not new to Pho, I haven’t ever been able to try meatball pho, because meatballs typically aren’t gluten-free. I was very excited to try Kitchen Accomplice when I heard about their products. I love cooking with broth and stock because it adds so much flavor to dishes. However, I usually only need a little bit for whatever recipe I need and end up wasting half of the carton. 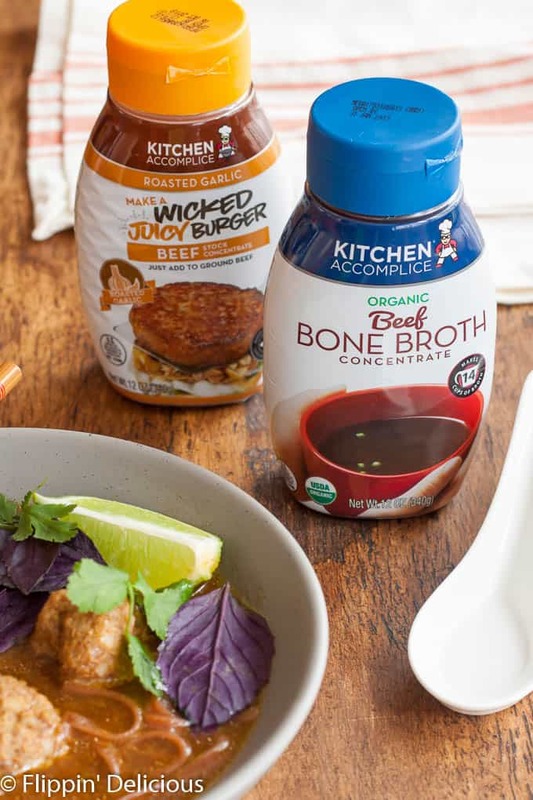 Kitchen Accomplice makes concentrated broths, Wicked Juicy Burger stock concentrate, and even Bone Broth concentrate. It comes in a squeeze bottle (that lasts for 6 months in the fridge after opening) so that I can easily mix up a cup or two for a recipe, and not waste any! I used the Roasted Garlic Wicked Juicy Burger in my meatballs, which gave them a great flavor, with minimal effort. I didn’t have to measure out a half a dozen seasonings to get the savory flavor I craved. The same goes for the broth and noodles. All I did was add a good squeeze of Beef Bone Broth concentrate to some water, toss in some meatballs, and let it cook. Once the meatballs were done, I tossed in some rice noodles and let them simmer. 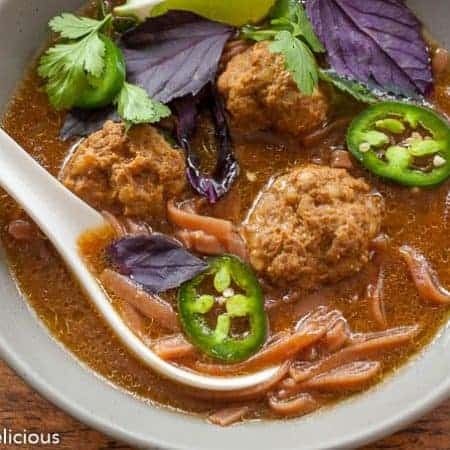 This gluten free Asian meatball soup recipe made a super easy one-pot meal! Ever since I got an Instant Pot, meatballs have had a regular spot in our dinner rotation. They are so easy to make! I will mix up a “family value pack” of ground beef, and scoop it into meatballs, and put them in the freezer. It is any easy way to make dinner one night, while also making dinner for a few nights in the future. I pull the frozen meatballs straight from the freezer, into my instant pot with sauce or broth and 18 minutes later, dinner is served. 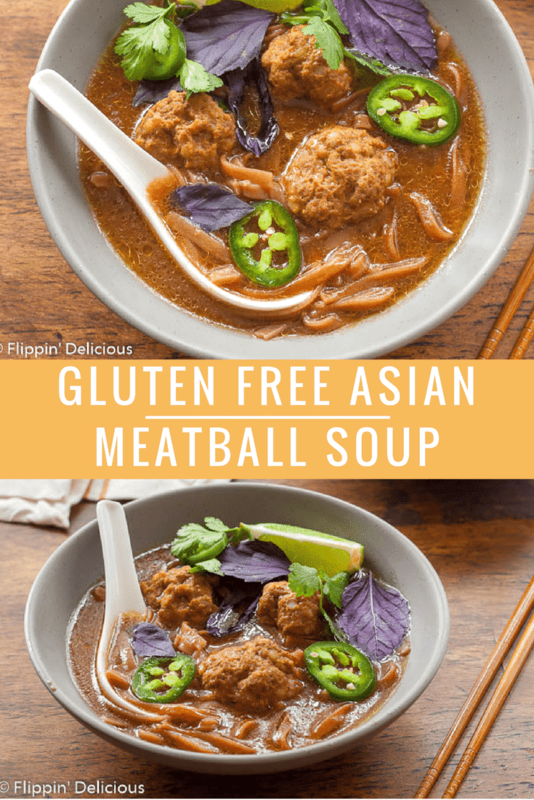 Though we haven’t tired of classic spaghetti and meatballs, I like to switch things up with teriyaki meatballs, and now with this gluten free meatball pho. So easy, and so good! 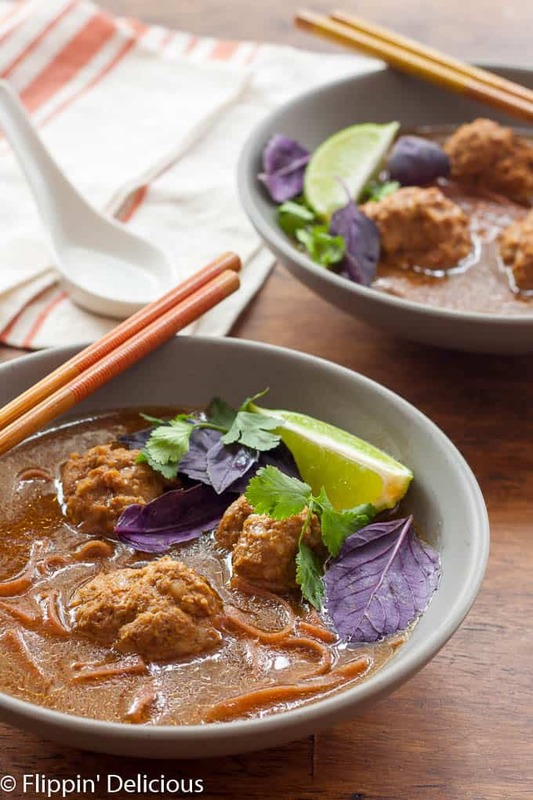 Gluten Free Asian Meatball Soup is inspired by one of my favorites, Pho! This flavorful bone-broth based soup can easily be made in an Instant Pot, or on the stovetop. In a large bowl, mix together all of the meatball ingredients until evenly combined. Be careful to not over-mix. Scoop the mixture into meatballs using a 1½ tablespoon scoop, then gently roll each scoop into a ball. Place each ball in a freezer gallon bag. Congrats, you just made 2-3 dinners! Release the pressure, remove the lid, and switch the Instant Pot to "Saute". Season to taste with fish sauce, and add the rice noodles to the soup. Once the rice noodles are cooked, remove from heat. Garnish with basil, cilantro, lime wedges, and fresh sliced jalapeno as desired. you are aware that both soy sauce and fish sauce have Gluten in them right? Hi Lorna, I used a gluten-free soy sauce (they are readily available, and I think I noted that was what I used). I’ve never seen a fish sauce that had gluten in it. I’ll make sure to note to use gluten-free fish sauce. Thank you. This soup sounds like it would hit the spot right about now. I can’t wait to give it a try! I’m always looking for dishes to switch up our dinner routine, this one looks so fun! I haven’t seen this broth but I’m definitely going to go check it out! Bone broth all the way! So good for you. Plus, one can never have enough Asian recipes. Love Asian-American food! (Not the real stuff though, lived in China for four months and basically starved). Hahaha. I am also a fan of Asian-American recipes. Wow, the dish looks so good. I will make it at this weekend. Thanks! I’ve tried to cook Pho for a couple of times. So I think I should try your recipe soon cause it’s pretty easier than my Pho’s recipe. Haha! Thank you for this quick and easy follow intruction! Pho is one of my favorite Vietnamese noodle soup. We typical boil the ox bone for many hours for the flavor to come out. We also add in raw beansprouts into the bowl on top of the noodles before pouring over the hot soup. Gives the dish a good contrast in texture.